The functions of garments merchandiser is to source, plan and execute the garments export order. The function of sourcing is a very essential one as it is co-related with cost and supplier relation [vendor management]. According to Wikipedia, “In business, the term word sourcing refers to a number of procurement practices, aimed at finding, evaluating and engaging suppliers for acquiring goods and services”. The process of sourcing can be domestic or global. Sourcing for apparel merchandiser and most important key points have vastly discussed in this article. The functions of garments merchandiser in domestic and global sourcing re given below. The garments merchandiser sources for components of the product domestically or globally. The supplier is assessed on price and quality standards, timely delivery, image of the supplier, capability to complete the volume of the order, laws, transport, and various costs involved. Today an order is floated among multiple suppliers they may be domestic and global. The apparel merchandiser establishes a domestic and global supplier base. This base is established by looking into catalogues, magazines, trade journals, websites, listing given by relevant trade organizations or the relative government bodies etc. The world has become an open market for sourcing, buying and selling. In order to cut competition and save costs, it becomes inevitable to source a part of a product or the entire product at a price which is the least but maintains the quality standard required by the buyer. The garments merchandiser sources components for his product like fabric and accessories from the domestic or global sources to complete the order. The types of supplier’s in the market consist of a three type’s- manufacturer, wholesalers and retailers. Depending on the quantum of the order, the apparel merchandiser approaches any one of the supplier. A] Manufacturer: The manufacturer may have say 1000 meters per design or colour as minimum quantity for acceptance of the order. If this meets the garments merchandiser’s order requirement then the garments merchandiser will be able source the order with the manufacturer. B] Wholesaler: The wholesaler has a tie with the manufacturer. The requirements of various wholesalers are clubbed and the minimums quantities of the manufacturers are met. The wholesaler stocks basic goods that have a regular requirement in the market. The wholesaler also has his minimums quantities, say the minimum is of 500 meters and above per design or colour for acceptance of the order. If this meets the garments merchandiser’s order requirement then the garments merchandiser will be able source the order with the wholesaler. Buyer’s requirement for the order quantity is small; such a small order may be accepted by the garments merchandiser to please the buyer who is continuously feeding him with orders throughout the year. A small order quantity may be due to the requirement is only for a part of the garment like yoke, collar etc. The retailer may have a men’s wear store where he wants to stock for sale shirts, trousers, handkerchief, socks, ties etc. The retailer may have a factory producing shirts. The sale of items other than shirt may not justify the expenditure of setting a separate unit to manufacture them. It is in this case that the retailer will source the required products [trousers, ties, socks and handkerchief] form another retailer, he may market this under his brand name or the brand name or the supplying retailer brand to show that he is providing a basket of brands. The garments merchandiser has to very alertly research and tally prices based on different sources and viable quantum’s and discounts available of each supplier, evaluate all parameter before negotiating the price and placing the order. While sourcing the apparel merchandiser should understand that why prices of the same product vary from different sources like a manufacturer, a wholesaler and a retailer. It is on the basis of this research and analysis the garments merchandiser manages to save cost for the company and proves to be an asset to the company. Due to competition the prices will vary manufacturer to manufacturer, wholesaler to wholesaler and retailer to retailer for the same product. This assistance is offered in terms of discounts. Listed below terms are the different types of discounts. Cash discount offered by the supplier: The supplier provides a certain amount of discount on purchase, if the payment is cash. Volume discount offered by the supplier: The supplier can provide a certain amount of discount on the purchase if the volume is huge or up to certain level acceptable to the supplier. Seasonal discounts offered by the supplier: The supplier can provide a certain amount of discount on the purchase if products are brought in off-season. The buyer’s merchandiser sources globally, once their product range, order quantity; size ratio and target price is finalized. This requirement is floated globally i.e. that is to various countries. Samples from all suppliers [exporters] are attained. The quality, understanding on the design concept, stitching quality, delivery period, past performance, price of each supplier is evaluated. The order is then placed to the supplier [exporter] matching the buyers criteria. The need for sourcing arises globally for the buyer because the same product is more expensive to manufacture in the buyers country and such a cost is not viable to cut competition. The garments merchandiser may source certain components of the final product globally because the component can be so extraordinary in all sense [price, cost, quality] that it becomes mandatory to order from that particular global supplier e.g. buckle and other bag accessories form China, . It can also be that the buyer has a nominated supplier for say labels, since the nominated supplier has approved details worked out with the buyer on format, content, garments washing instruction size and quality of label. The buyer does not have to go through again and again with approval of each label with each and every supplier [exporter]. This way the product [label], price, quality is standardized and approved. Each label is given a code and the apparel merchandiser, buyer’s merchandiser and label manufacturer speak in the same code, confusion is avoided and production is faster. The garments merchandiser might decide to buy extra if the goods are regularly required or request the buyer to increase the order quantity in order to obtain an effective price. Once the price is negotiated the order is placed .The order placement is done on a format which is called a Purchase Order. All requirements like assessment of quality, legal terms, product specification, contract terms, point of delivery, date of order, date of delivery, name and address of the supplier, confirmed price is added in this format. The purchase order is signed by the apparel merchandiser and with the approved sample submitted to the purchase department to procure bulk. Image of the supplier: Thorough background of the check should be carried out of the supplier in the market with associated trade organizations, banks, related government bodies etc. to verify the authenticity of the supplier i.e. He has in the past given others the right product, committed to the price and quality, timely deliveries, no child labour, no prison labour was used. In short the supplier past performance is good and he is a reliable supplier also he has no fraud or links with terrorist to his credit. Facilities provided by the supplier: The supplier may provide various facilities to maintain improve the relationship with the buyer and work as a team member e.g. The supplier [exporter] sometimes offers to air ship certain quantities earlier to satisfy the buyer and bears the cost too. The supplier[exporter] helps in creating new development, he and also keeps the buyer abreast of the new trends in his country in terms of fabrics, accessories, prints, embroidery etc so that the buyers range that is developed becomes exclusive and competitive. The [laundry] supplier may offer transport facilities free of cost to pick up raw good and dispatch finished goods. The level of adaptability of the supplier: In times of crisis how much the supplier willing to compromise. In case, the buyer has made last minute changes e.g. in the design element of printing, is the supplier [printer] willing to make to redevelop without affecting the pre-fixed price? Capabilities of the supplier: To evaluate if the any supplier domestic or global has the financial capabilities and production facilities i.e. factory, labour to complete the order. A trust has to be developed with the supplier. A certain amount of data can be shared to increase his performance. Every supplier is evaluated on the basis of his past and present and performance and also his ability to execute the order taken. The supplier is evaluated on the basis of his compliance with the buying company’s goals, standard and specifications, rules and regulations. One has to understand every garment that is short shipped, late shipped or rejected is a loss of a sale to the buyer because he has pre-sold those goods. It is a loss of his targeted revenue, his entire planning gets disturbed. The buyer may in such cases debit the supplier [exporter] depending on the extent of damage. A debit clause is mentioned in the L/C for short shipment or rejections. The function of apparel merchandiser is to establish good terms with the buyer which based on honesty, trust and supplying approvals and data required in time. The buyer maintains a record of all the suppliers where the below given criteria is tabulated. [Table-1] The order for the next season is given to the supplier based on this evaluation. Number of Rejects: Out of the total order delivered what was the percentage of good matching the buyer’s standards, what was the percentage of rejects? Timely Delivery: Out of the total order what percentage was delivered in time, the balance was delivered in how many installments and if the order was finally completed? Time taken to process the order: The time taken by the supplier to finalize the costing, providing samples for approval, documentation for shipment, and if the goods were shipped within the time frame provided in the L/C i.e. met the vessel date or extensions were given. Adherence to buyers qlty. Stds. Money required for import etc. By this tabulation GHI company stands first, ABC company stand second, DEF in third. This does not mean that GHI Company will get the order. Each company has it priorities to evaluate and give the order to the supplier. For some cost, quality, delivery is important, to another cost quality, social and cultural factors are important etc. Therefore the buyer analyses a lot of points before sourcing from a particular supplier. As internet is used for sourcing there are number of IT applications that are being used. Global sourcing has factors posing as disadvantage; there may be a political, social or economic disturbance in the supplier’s country that hampers the supply of goods or services. Long distance monitoring of the order is difficult, timely deliveries, changes in laws and regulation of export and import, documentation, embargos [trade restrictions], change in custom duties, port shutdowns, fluctuation of currency, transportation costs, corruption and malpractices, fear of loosing intellectual property etc. But the advantage of cost reduction, having multiple supplier base to source from, greater efficiency, better products, reduction of impact on environment, new developments, override any risk. 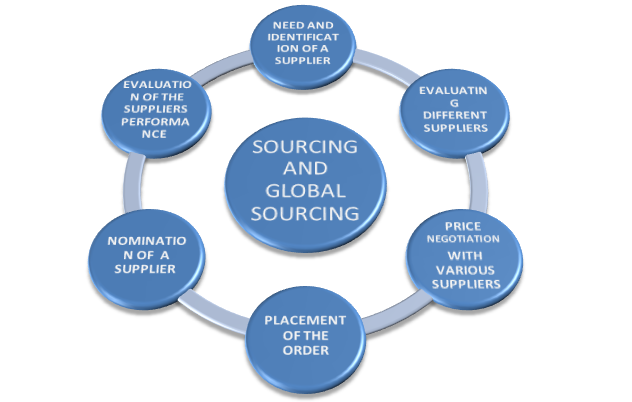 Differentiate what is the meaning of domestic sourcing and global sourcing? Why does the need for domestic sourcing and global sourcing arise? How does a retailer function vary as supplier for fabrics and accessories and that of readymade garments? Explain why price varies due to types of suppliers, quantum of order and discounts offered by suppliers? What are the points that must be kept in mind before finalizing an order, also mention the points that are to be mandatorily to be listed to format a perfect purchase order? What are the parameters one must evaluate of the suppliers before placing an order? What are the names of the IT applications available for both of the sourcing? What are the advantages and disadvantages of sourcing?